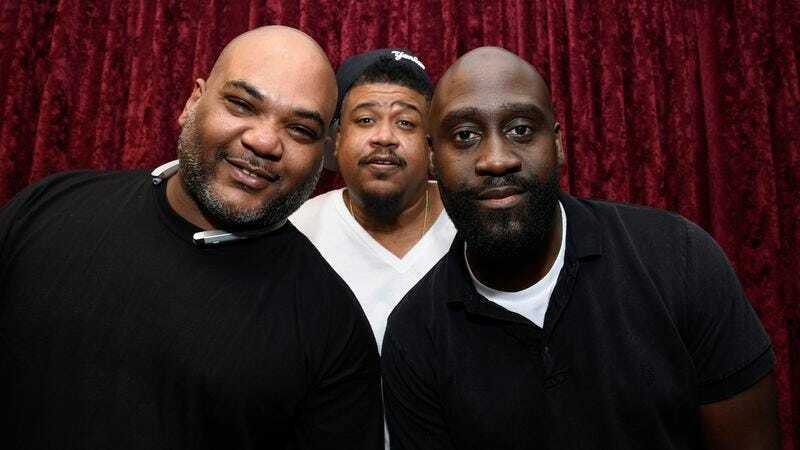 Seminal hip-hop group De La Soul was born from the suburban streets of Long Island almost 30 years ago now. Since releasing the classic 3 Feet High And Rising in 1989, they’ve recorded seven more albums of varying critical and commercial success, with a ninth one on the way. Their new single, “Royalty Capes,” off the upcoming And The Anonymous Nobody, makes a smirking nod toward their long history as a beloved, if not bejeweled, pillar of the genre. The band describes the bass and sax-heavy “Royalty Capes” on Facebook as “one of the first songs recorded during early jam sessions” for the new album. Recording started at The Bomb Shelter and perfected at historic Vox Studios in LA with an unorthodox 9 bar loop of saxophone slowed down and reconstituted for Pos and Dave. It was one of those rare moments where he Dave wrote his part first. Dave said it just sounded like royalty walking in, and he put his rhymes down, and Pos followed his lead. And The Anonymous Nobody will feature performances from Jill Scott, Usher, and David Byrne, among many others. It’s scheduled to be released on August 26. If you can’t wait that long, here’s another single from the album, “Pain,” featuring both Snoop Dogg and a remarkably funky groove.